I started out enjoying this book and at first I was getting into it but in the end I think my expectations going into this book were pretty high. I felt a bit of disappointment. 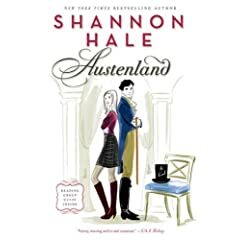 Originally, I did like the premise of book starting with a three week stay at a role-playing resort in England called Austenland, a complete immersion into Austen's world for obsessed fanatics such as Jane. Actually, I really liked Jane's Aunt Carolyn as a character, (who bequest the above gift to Jane in her will). As fleeting as Aunt Carolyn's character was, I found her amusing. Just the fact that Aunt Carolyn was so open to speak about how she led this wild lifestyle and then in the eleventh hour, so to speak, she found out that she really loved the man next to her after all. I couldn't help but wonder if Aunt Carolyn had ever stayed at Austenland. How else would she have known about it? Jane accepts the trip, I couldn't believe she even doubted going for even a minute and she heads to Austenland to live as Miss Jane Erstwhile, circa 1816. Here is where things get interesting and I don't believe Jane ever fixed her Darcy fanatic problems instead she runs away with Martin for TV basketball and root beer. This is where I couldn't relate, if I was in Austenland, I think I would want to be there. I could have the other things when I got back in three weeks. It was only for three weeks! Stay in 1816, I mean, Jane what are you thinking? Ok, so maybe I just didn't like Martin or I was suspicious of him but that's what I was wondering. Then Jane's former boyfriends became too fantastical for me or maybe a weird collection of failed fantasies. She needs to be in real relationships that have some nurturing time first. Ah well...what do I know? Of course, I haven't read very much "chick-lit" so perhaps that's why I was getting so frustrated or maybe it was for the valid reasons, Amanda, has already so eloquently stated. So, Jane leaves, finally, Austenland and she's followed by two men that she didn't really seem to have real feelings for or hadn't really been able to get to know them for all of the diversions that had been taken. She walks away and then one follows her again, really? Then making out on a plane instead of a real conversation to really turn her head around and find true love. That's not very believable either to me. But of course, it isn't meant to be real. I understand this and I just don't think that this book resonated with me this time. Perhaps, one of Shannon Hale's other YA books will be better for me to read next time. Lastly, I didn't think the whole Colin Firth theme was as huge in the book as I was anticipating which was fine with me. I don't mind Firth, as an actor, but my version of the perfect Mr. Darcy has yet to don the stage. "that she didn't really seem to have real feelings for"
BINGO! You hit the nail on the head, Julie! I couldn't help but think that this last relationship was going to end up just as failed as the others, because she didn't know the guy at all, nor did he know her. I wonder if that series of failed relationships says more for the state of relationships in this world than I made out when I read the book. I mean, Jane seems to know absolutely nothing about how to get to know and love someone. She's completely focused on herself in relationships. the feelings expressed by her and the men in the book are just fantasies, but it was a quick easy read for me...not the best austen-like book.